We get it. You're busy. Between the kids, a job, a commute to the city, who wants to add composting to their never ending list of things to do. Sure, it's great for the environment but composting is a commitment and if you commit yourself to one more thing it might just be the looney bin! We hear you and that's why we've taken away all the obstacles to composting with our BACKYARD COMPOSTING SERVICE . When you join our BCS family, you'll get all the benefits of composting without doing any of the work. Impossible you say? It's true. Just purchase a Start-Up Kit and we'll get to work! With BCS, all your finished compost goes right back from whence it came- into your property where it rejuvenates your soil. A year of composting can yield over 600 lbs of finished compost. No more trips to the big box store to buy organic fertilizers. You've just made your own! Want to know what kind of impact you're really making? As a BCS customer, we record your Diversion Stats - how much food you're keeping out of the landfill. Some of our customers have diverted over 100 lbs of food waste their first month of composting! No wonder our customers feel great about composting. Don't take our word for it, watch this video and see how composting has rocked Breena's world. 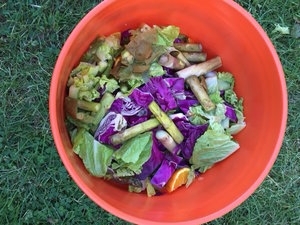 Throughout the week, toss your food scraps into closed-lid bucket. Leave bucket on back porch for weekly pick up, cleaning and disposal into your tumbler. We monitor, balance & turn your tumbler with wet and dry material to create great compost. Best part? We deal with the mess for you. 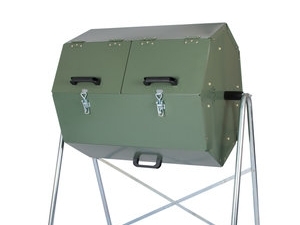 Once tumbler is full, enjoy nutrient rich finished compost in 6-8 weeks. Lawns & gardens topped with compost are healthier and retain moisture better. We can apply the compost for you. Don’t need it? Donate it to one of our urban farm partners. Click here to learn more. "I feel so much better about all the unfinished meals my kids leave behind knowing it's not just going in the trash. And the kids love clearing their plates into the compost bucket after meals, which makes clean up more fun for everyone!" "Composting requires very little effort on my part!" “This process has made me think about the small, easy things you can do to help our environment." "Java's Compost makes composting so easy and mess free."